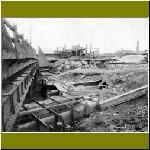 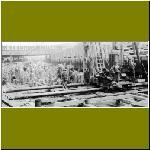 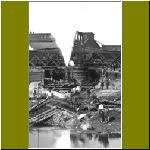 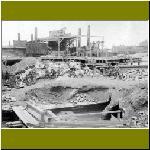 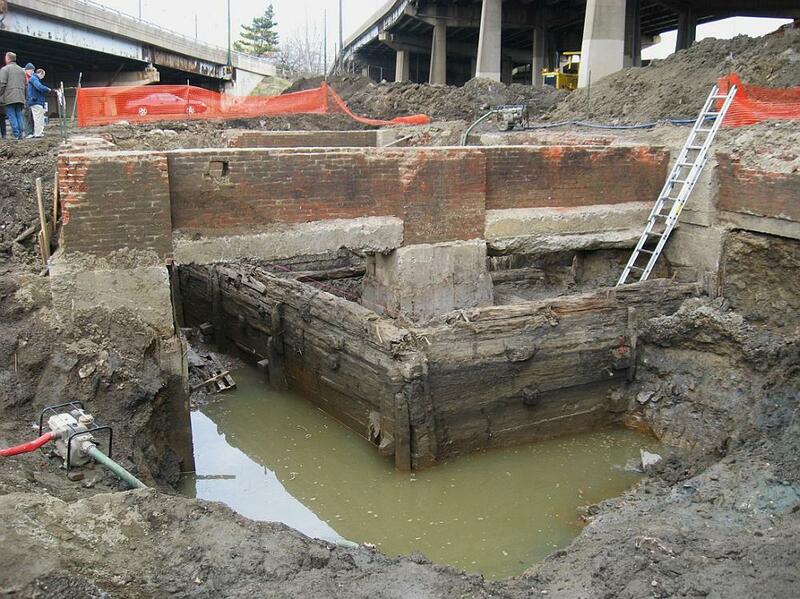 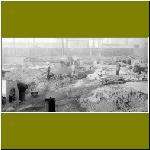 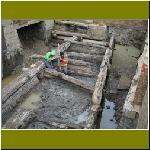 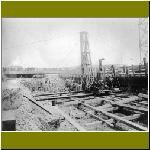 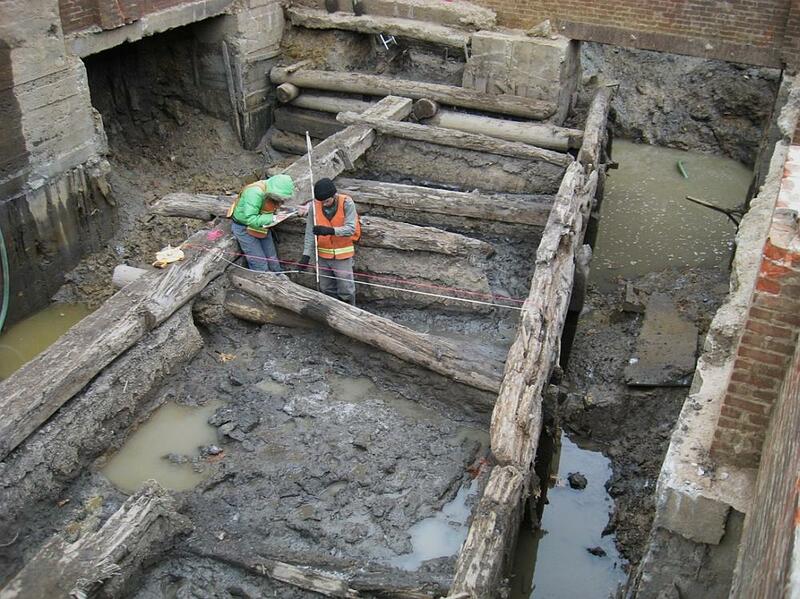 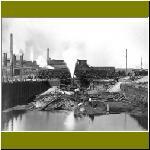 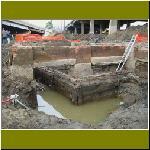 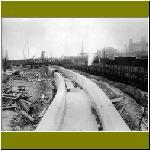 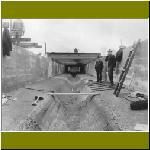 In December 2008 I visited an archaeological dig in the Port Richmond neighborhood of Philadelphia, conducted by the URS Corporation of Burlington, NJ, in which a section of the Aramingo Canal was uncovered near the Aramingo Avenue interchange of Interstate 95, work paid for by the PA Department of Transportation (PennDOT). 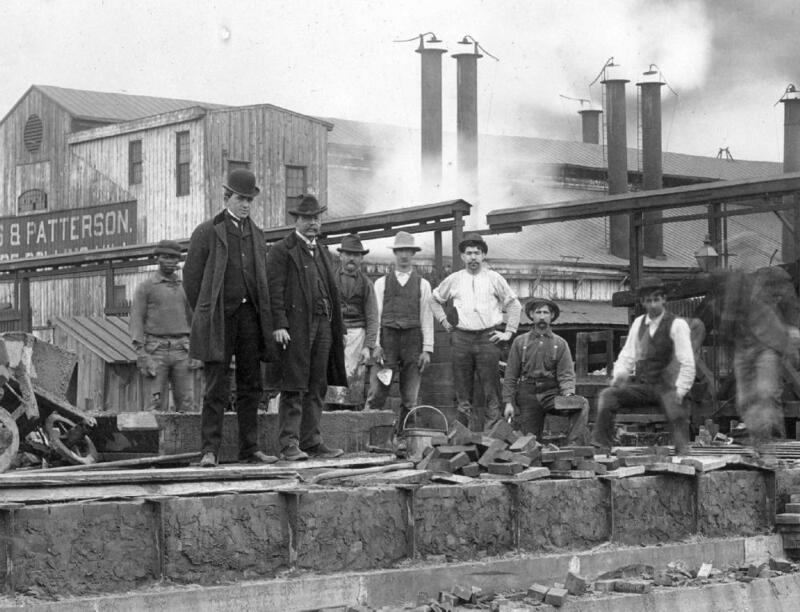 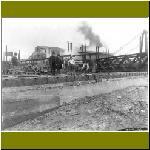 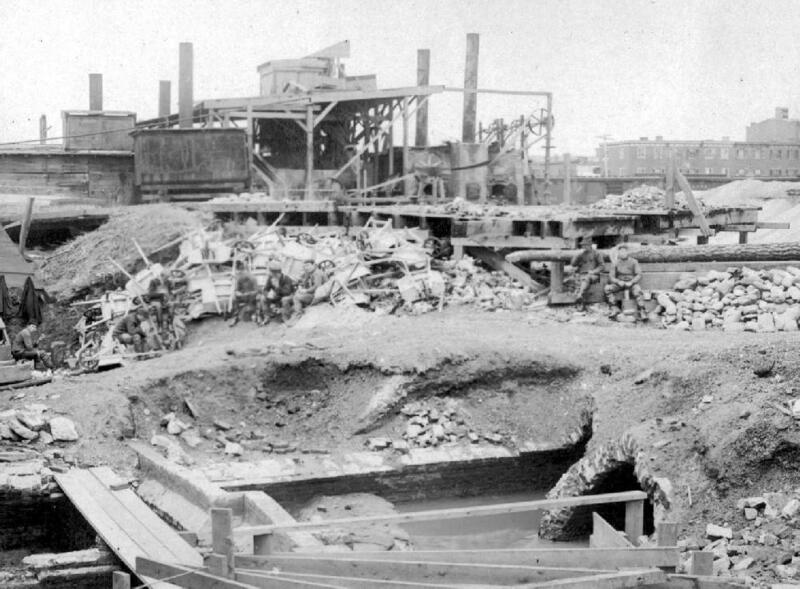 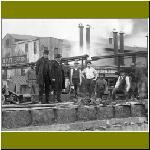 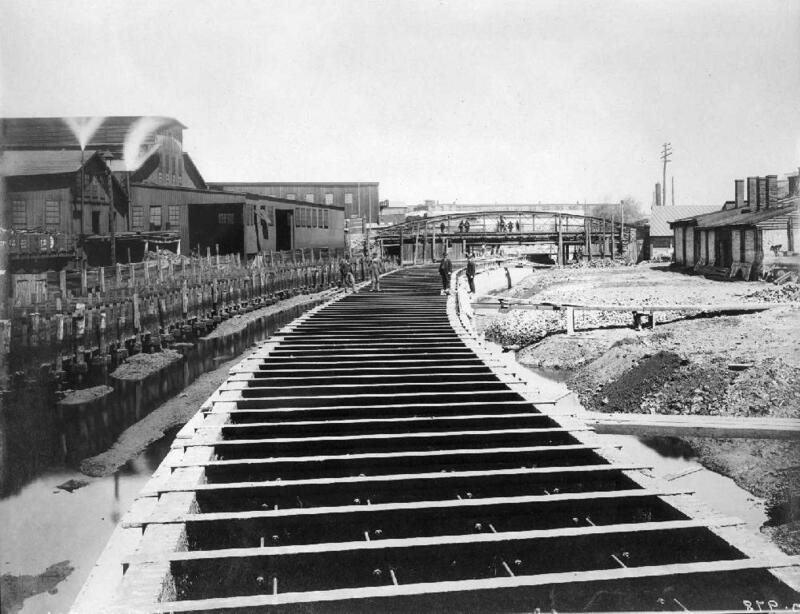 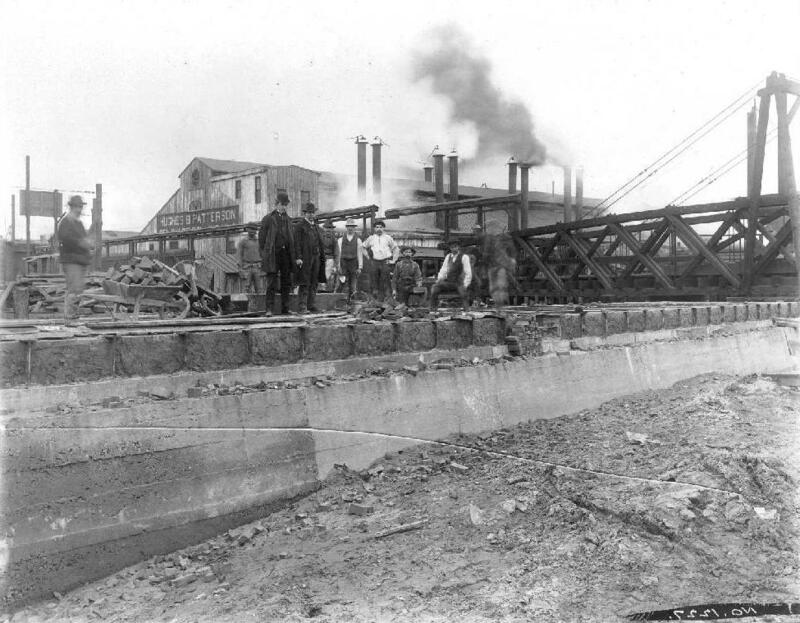 The canal company, incorporated in 1847, was authorized to construct a canal in the bed of Gunner's Run, a stream that emptied into the Delaware River at Dyottville Glass Works in Kensington. 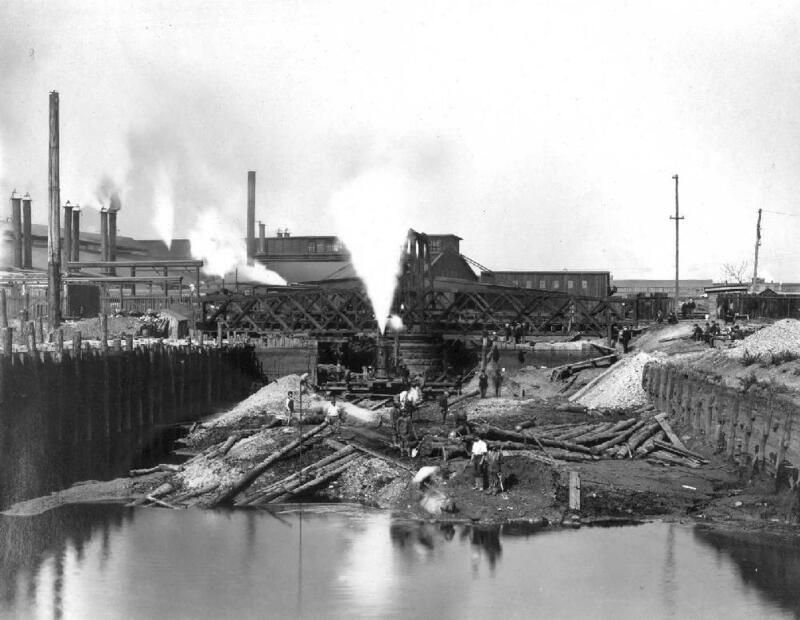 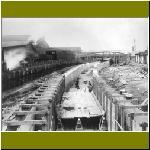 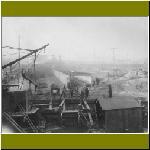 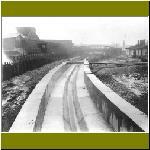 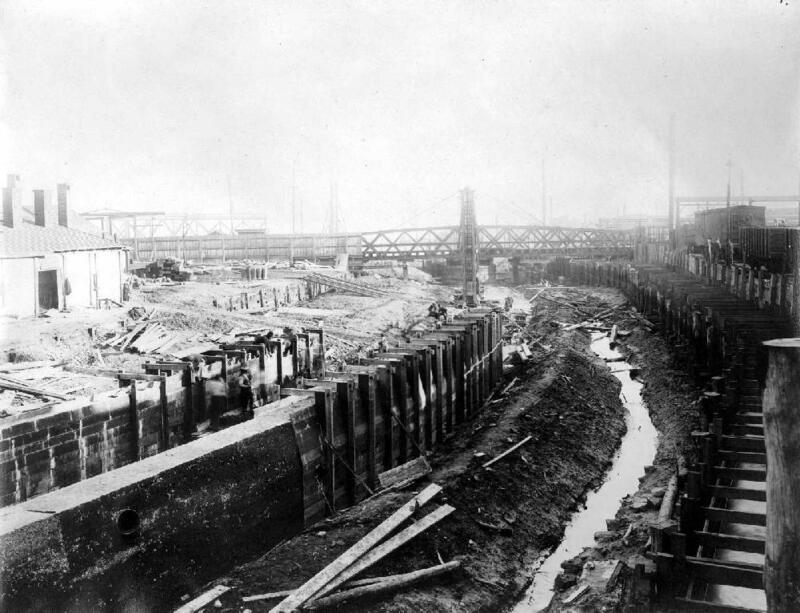 "It was believed that by widening and deepening the stream a grand depot for trade could be established near the [Richmond Branch of the Philadelphia and Reading] railroad with docks and basins, and that the ground available on either side of the creek could be made available for wharves, warehouses, etc....The work turned out to be useless. 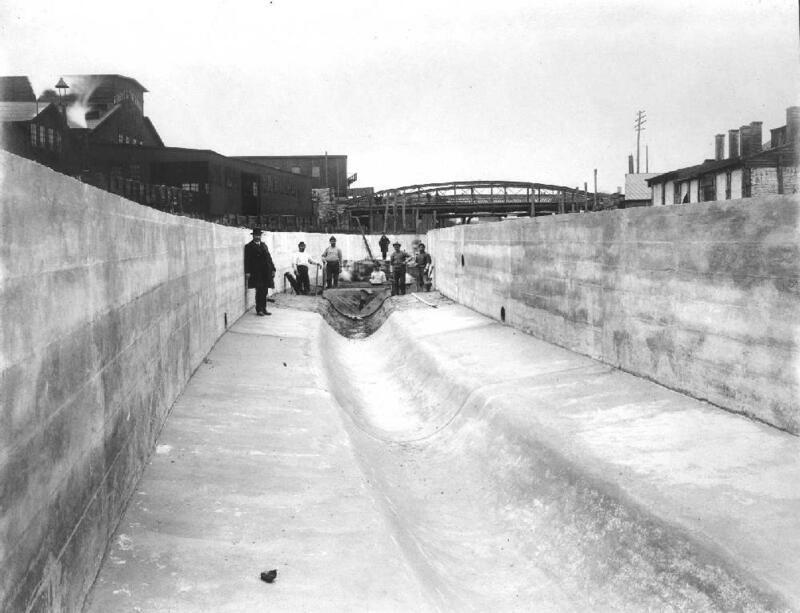 A great deal of money was spent upon it. 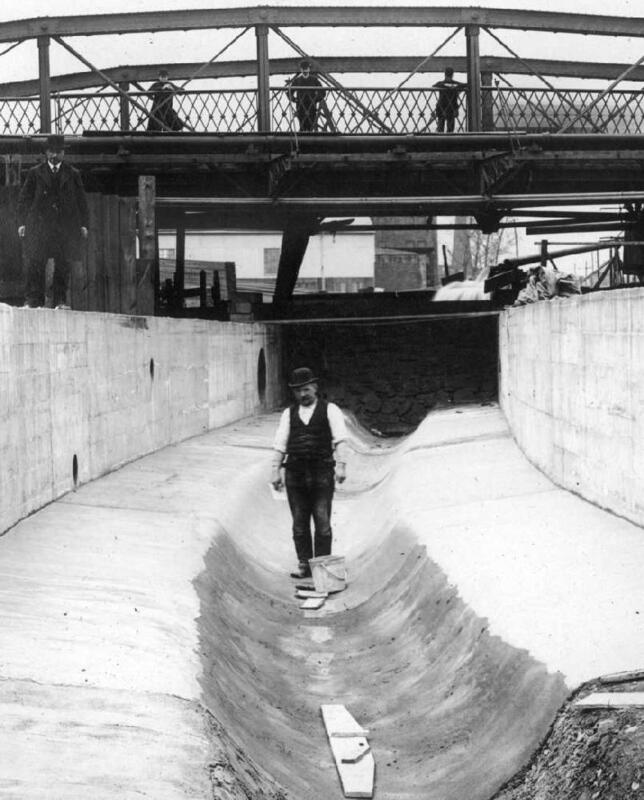 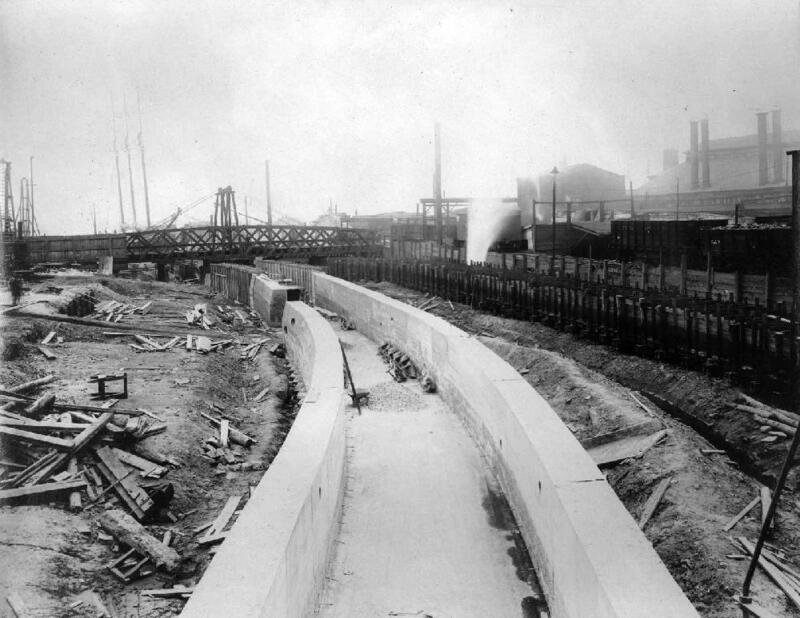 The amount of business done was found insufficient to pay expenses, and for many years afterwards the so-called canal was considered a nuisance." 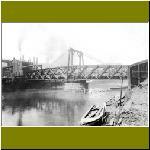 (from Scharf and Westcott, History of Philadelphia, Vol. 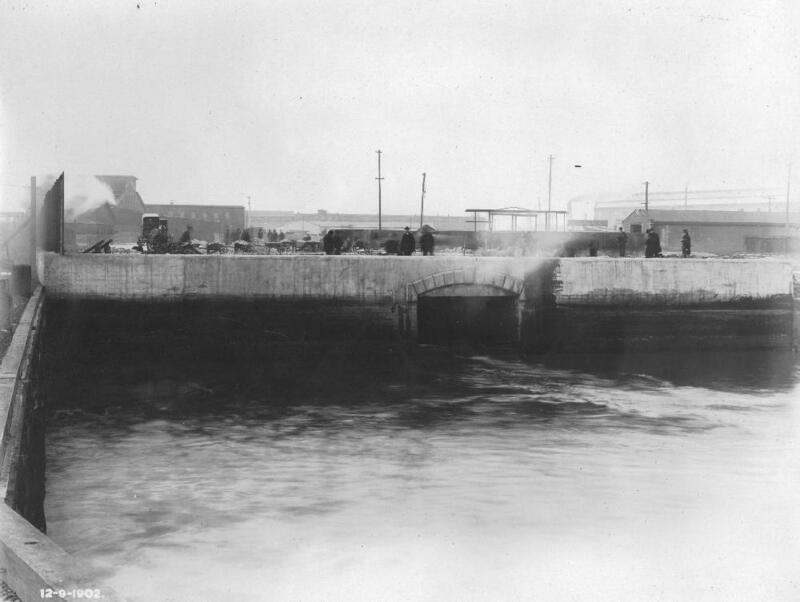 1, p 685). 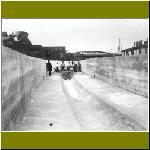 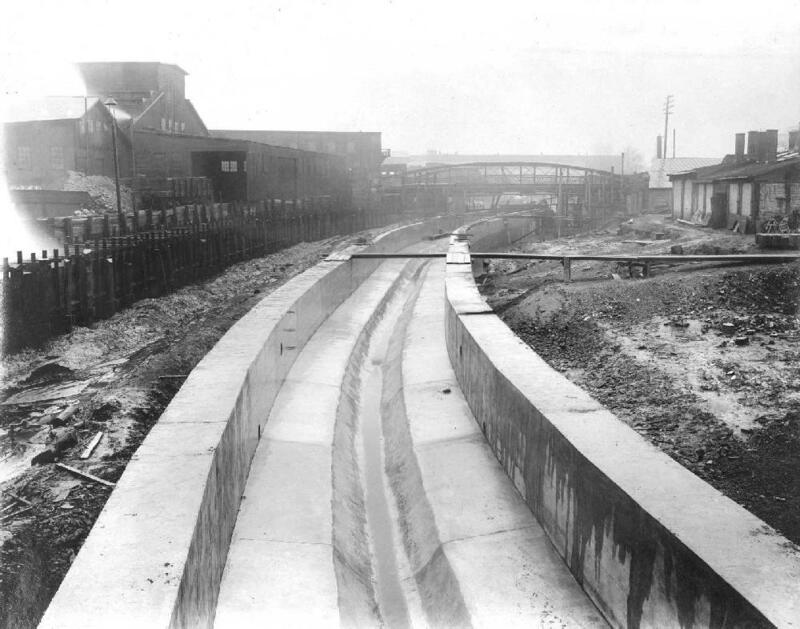 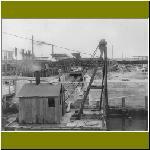 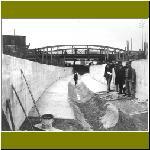 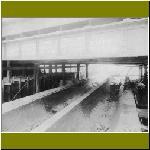 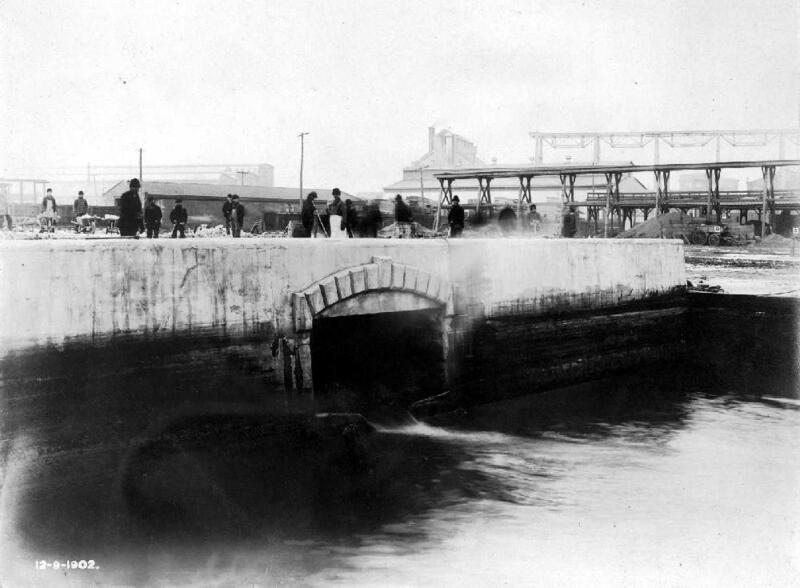 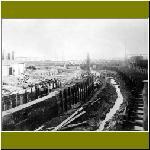 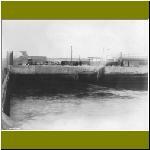 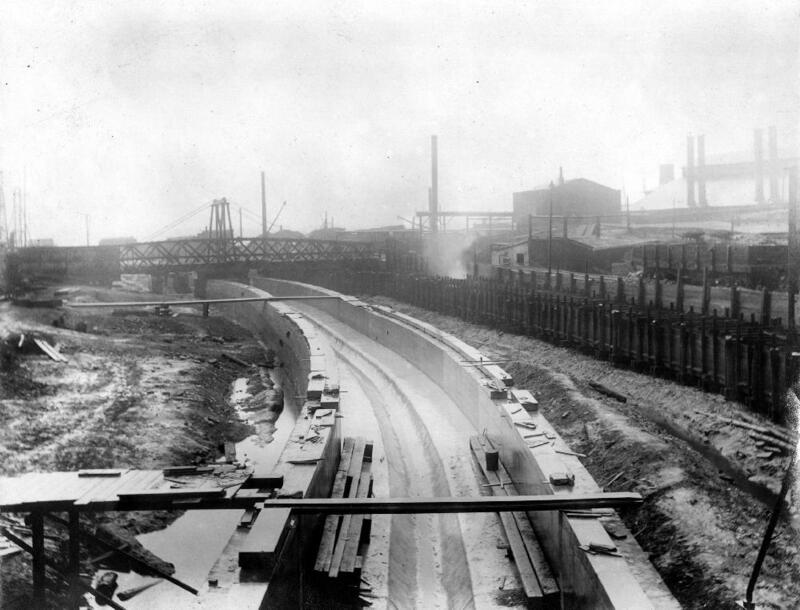 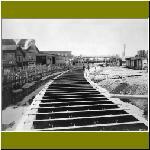 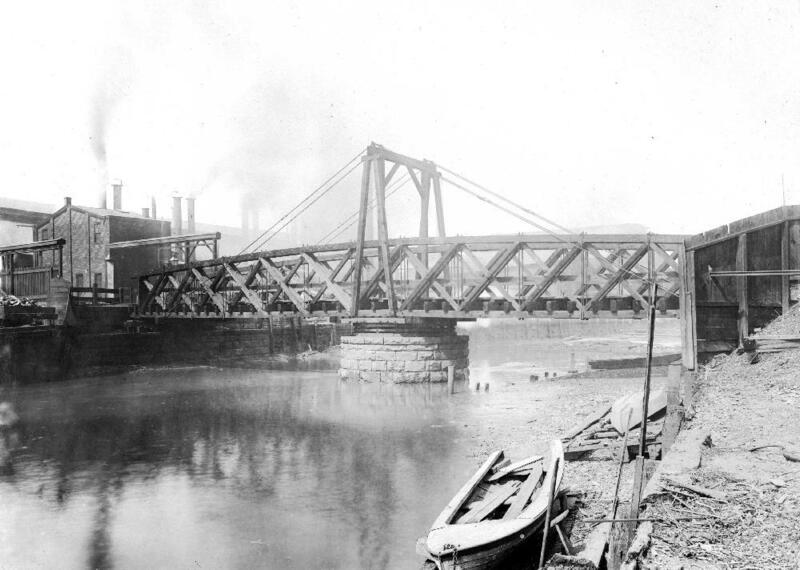 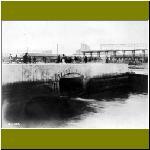 The creek-turned-canal became such a polluted nusiance that, beginning about 1900, it was covered over and converted into a combined sewer, as shown in the PWD photos below numbered 01 to 038. 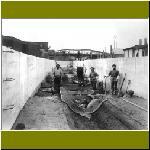 The modern photos are reproduced courtesy of URS, whose archeological team was headed by Anthony McNichol and included Doug Mooney (Project Manager), Jeff Harbison (Acting Supervisor), and a field crew of Lisa Geiger, Cristy Wallover, Alex Agram and Alex Devries. 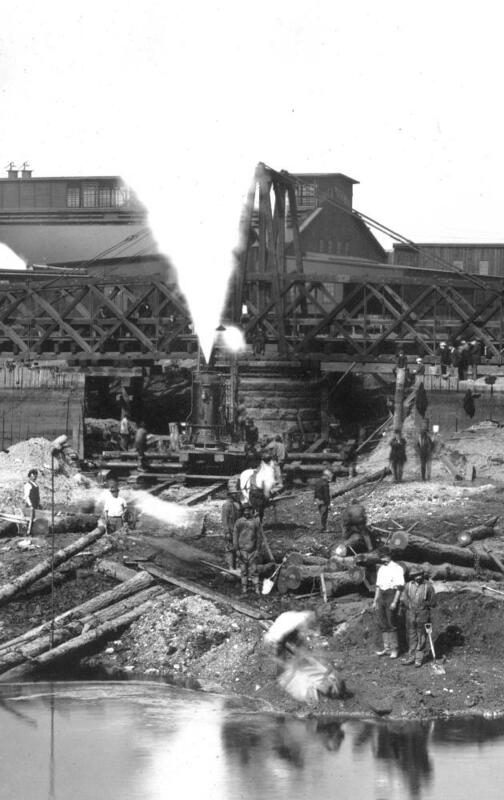 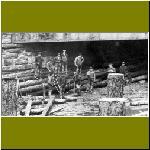 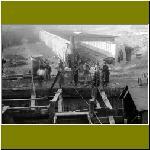 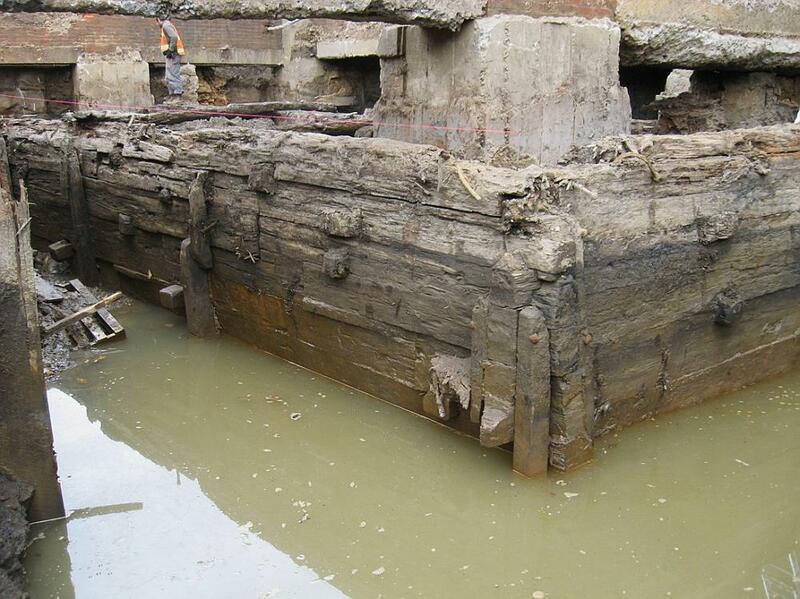 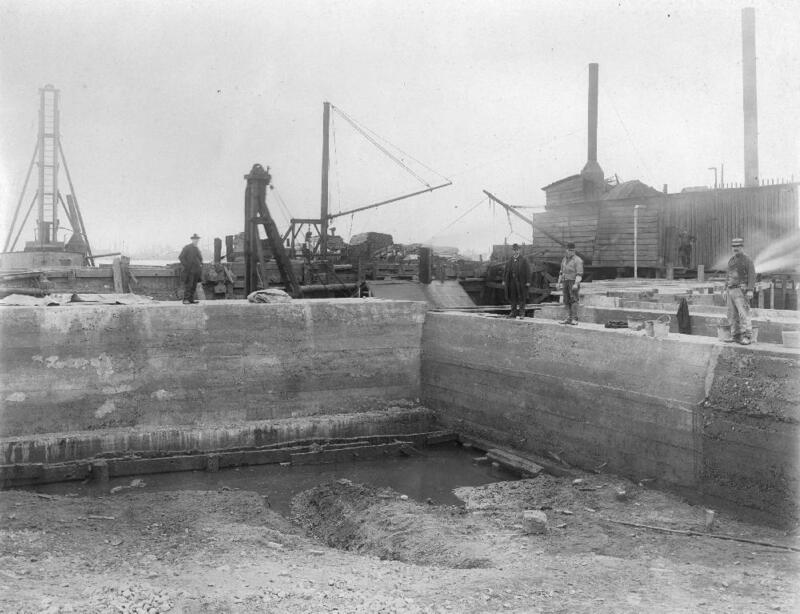 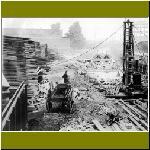 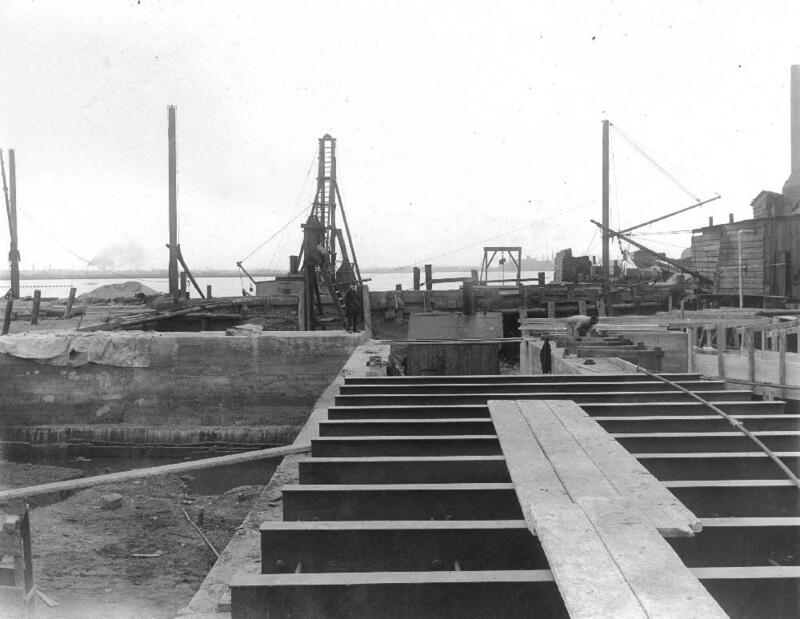 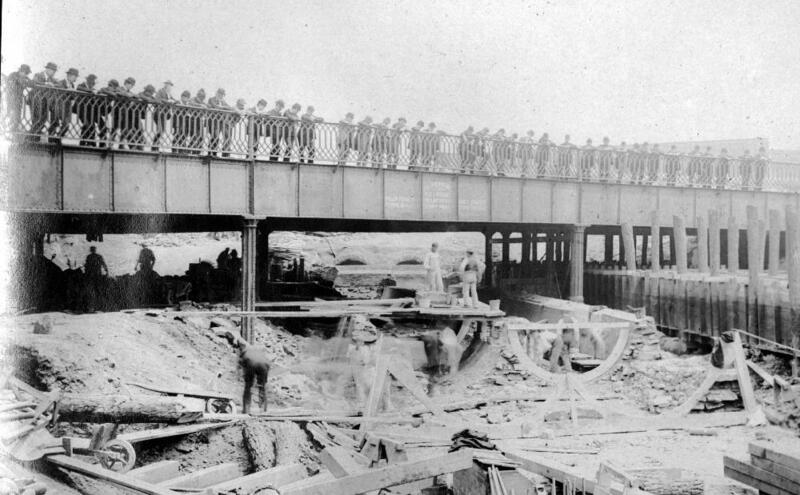 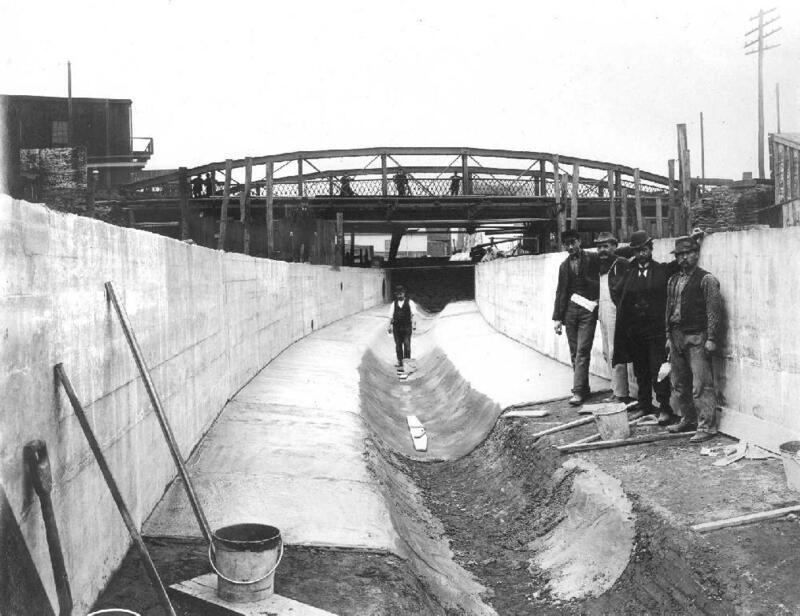 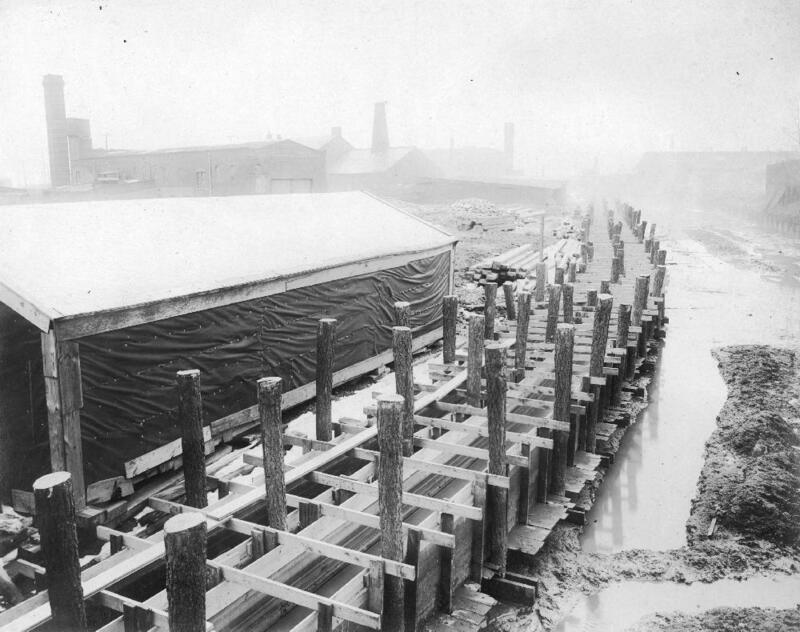 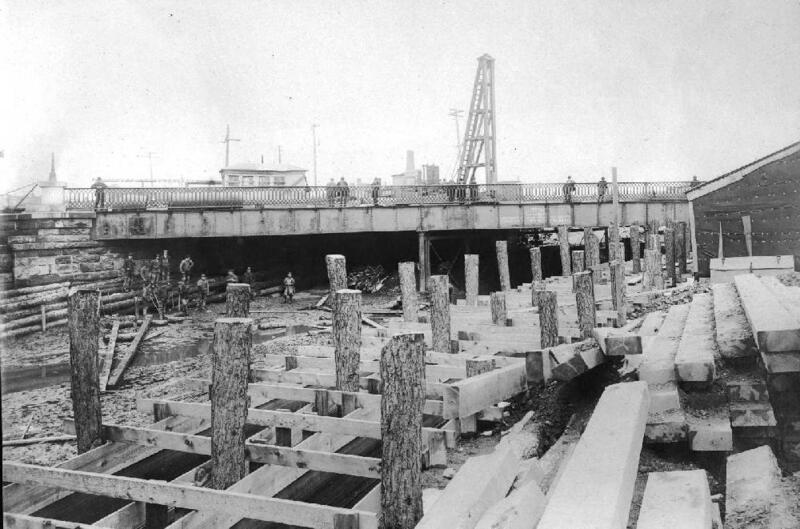 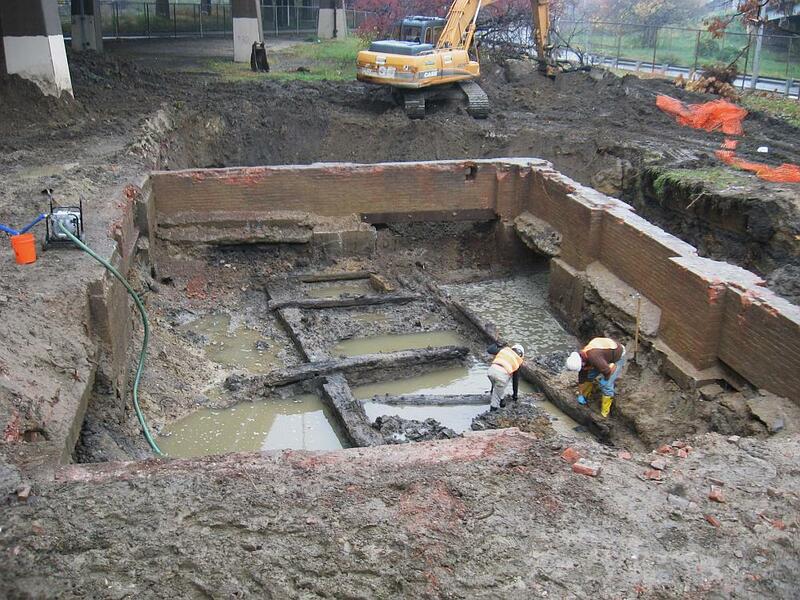 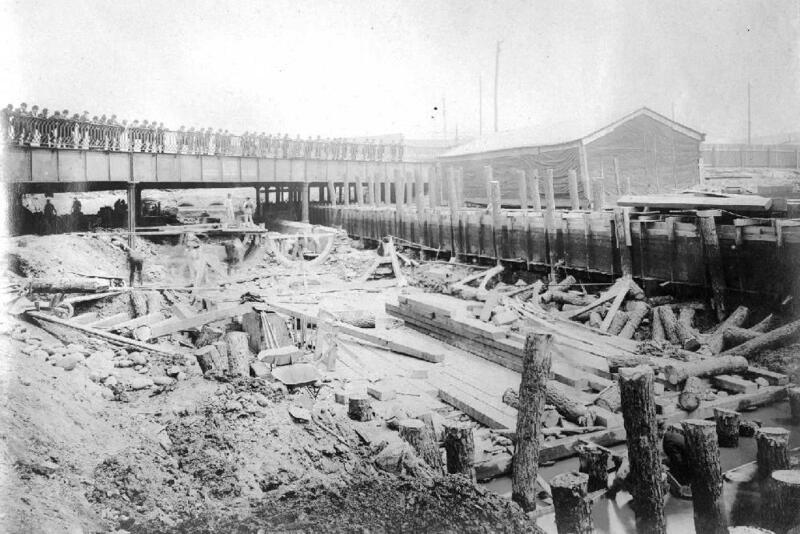 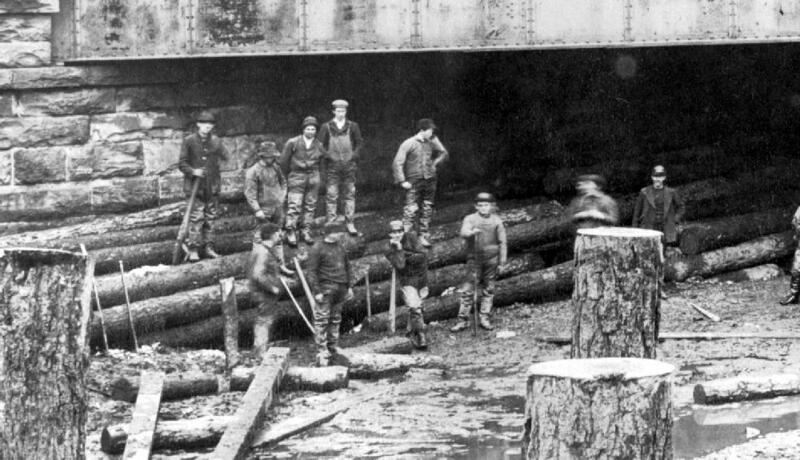 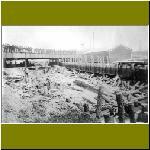 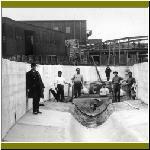 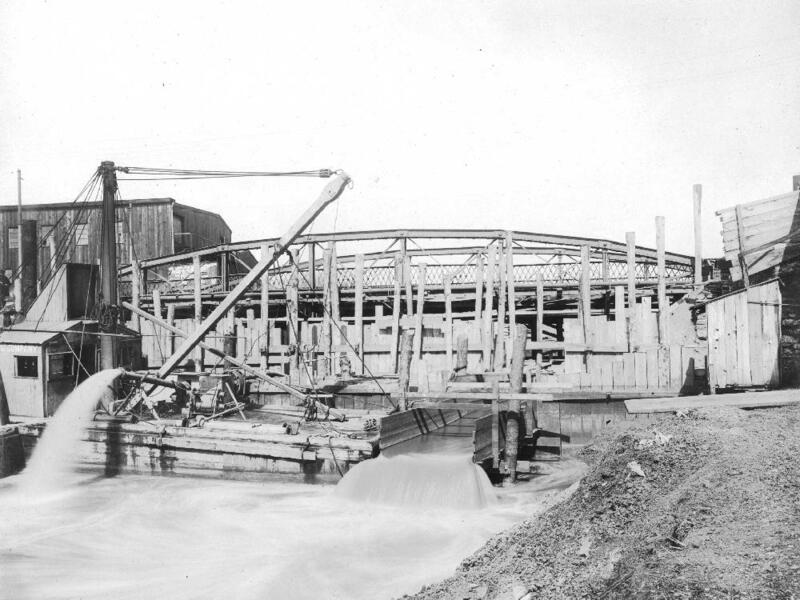 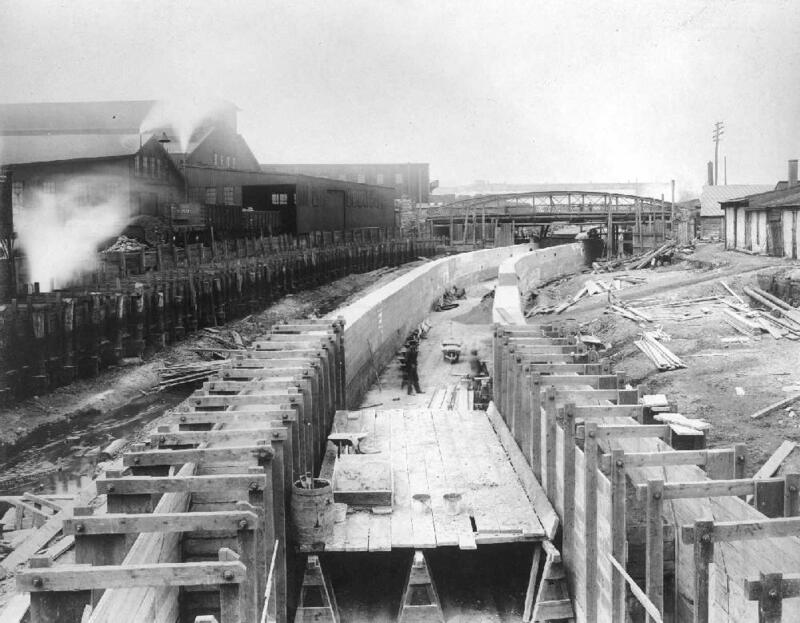 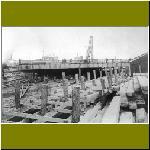 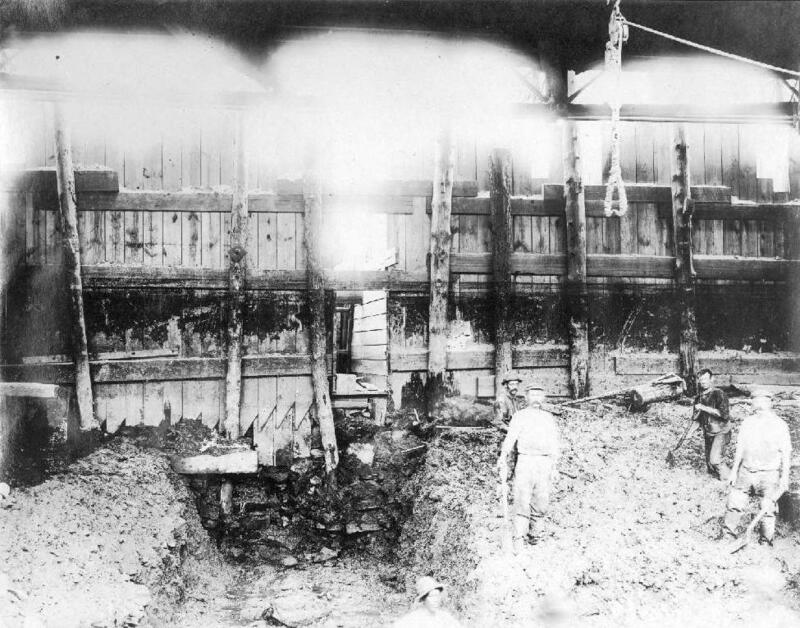 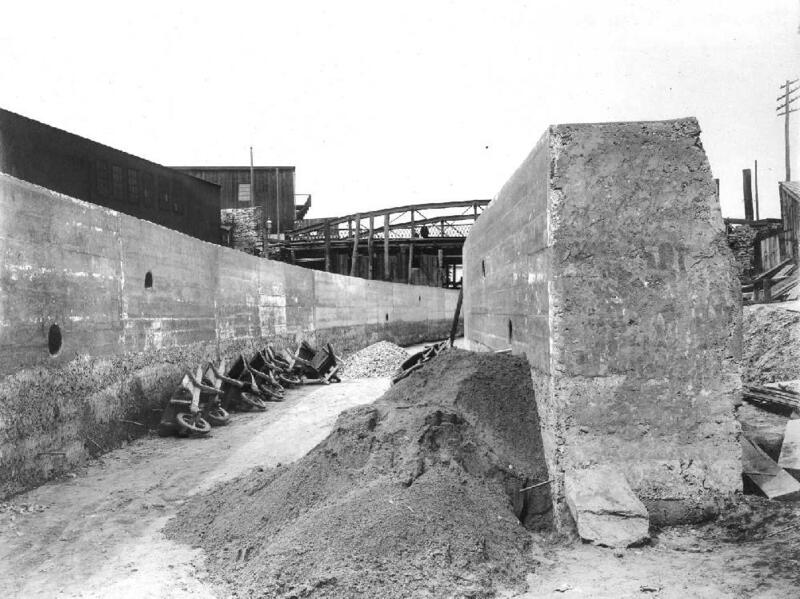 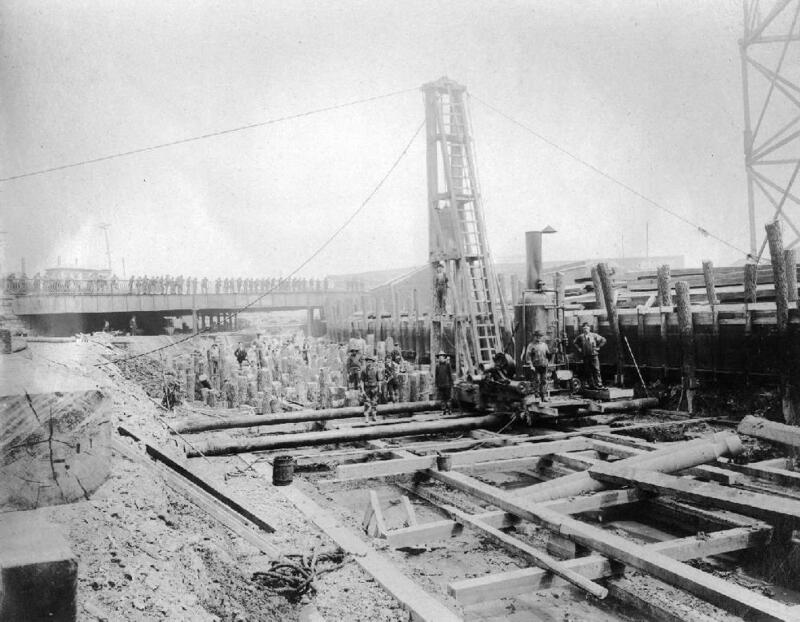 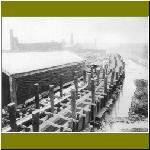 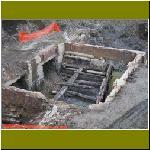 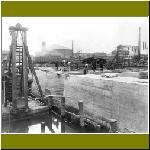 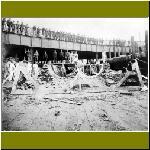 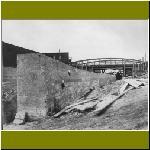 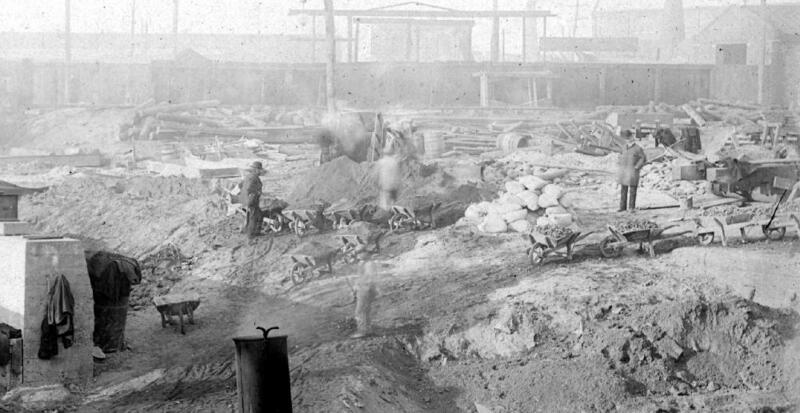 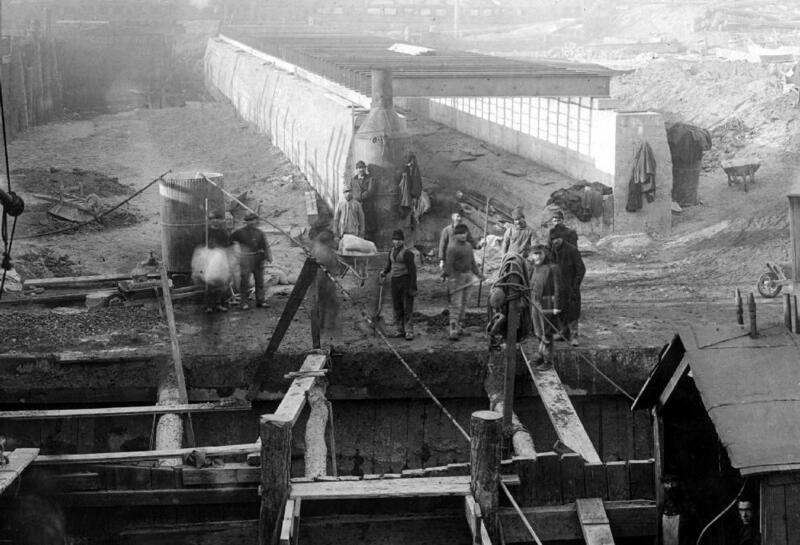 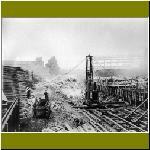 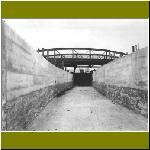 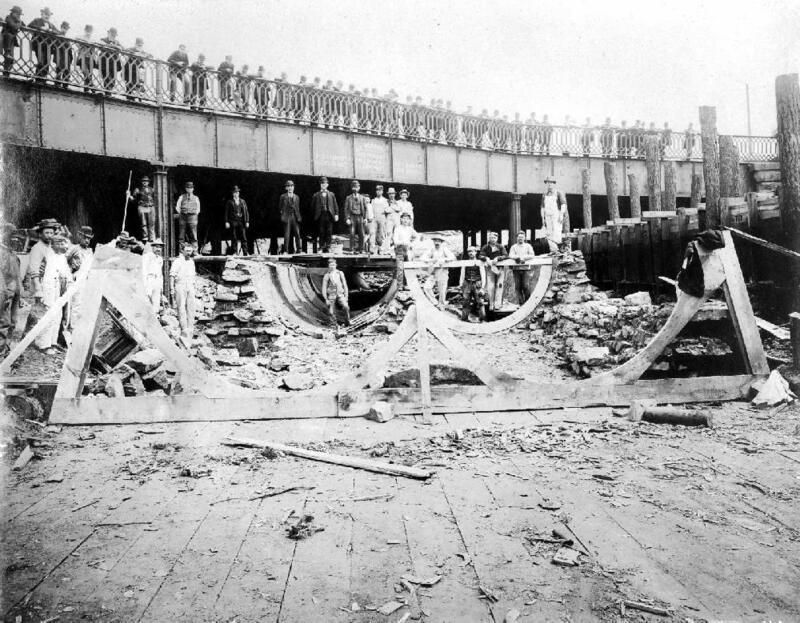 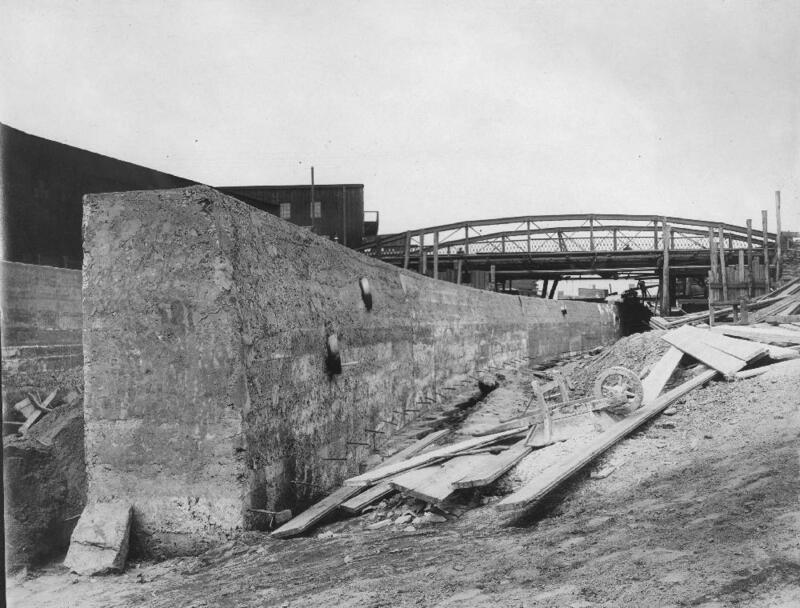 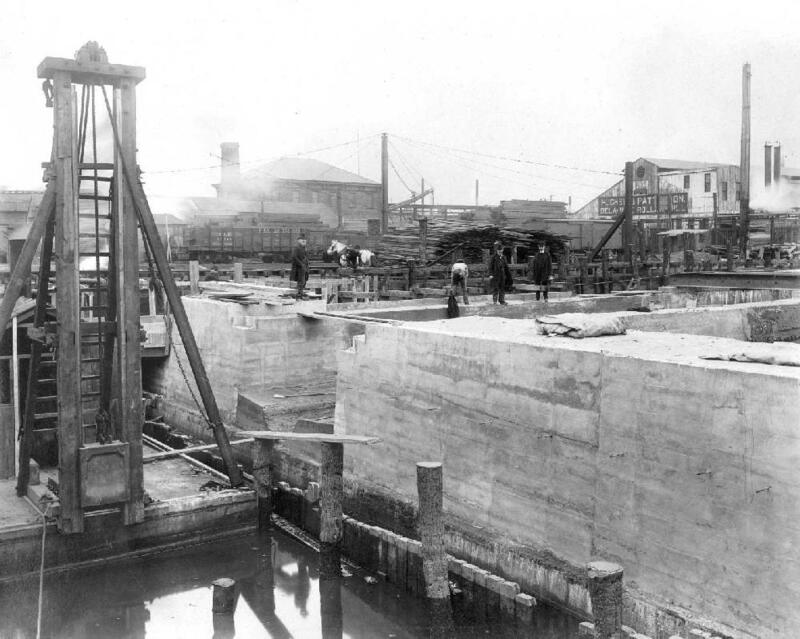 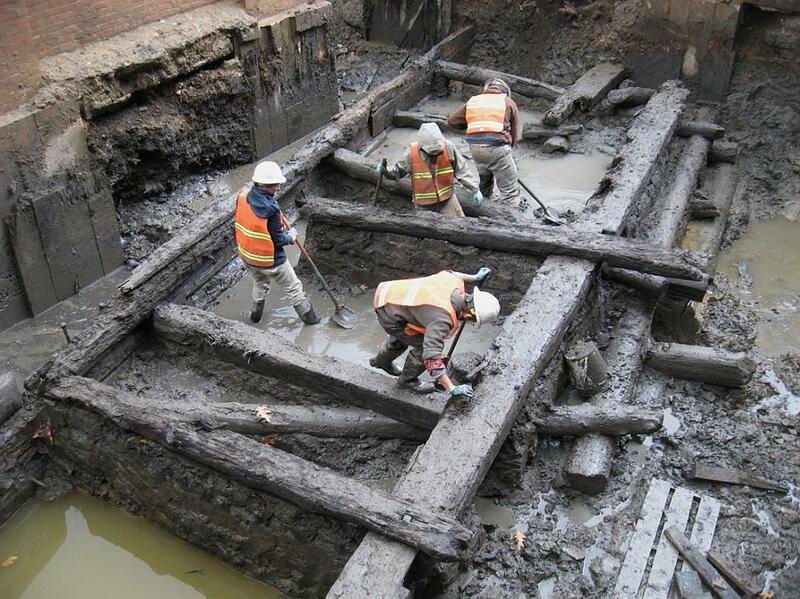 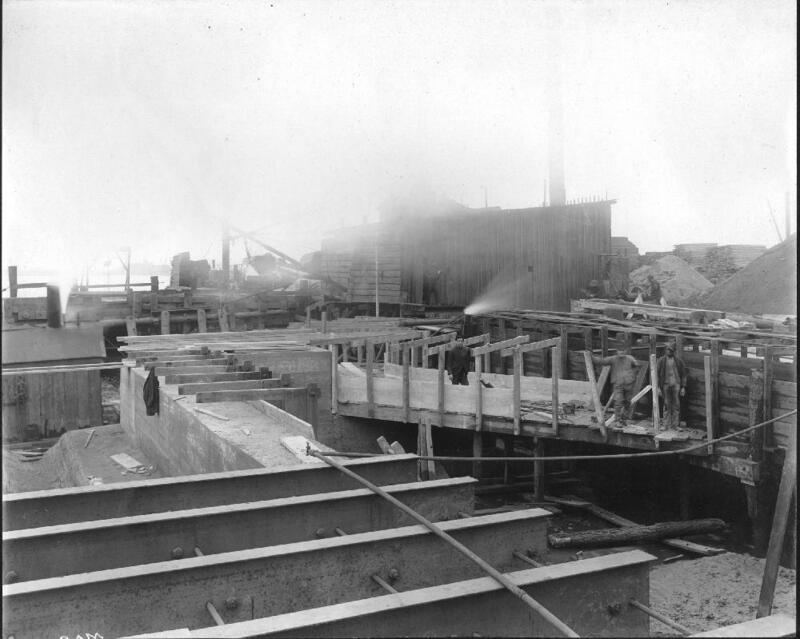 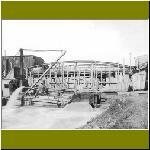 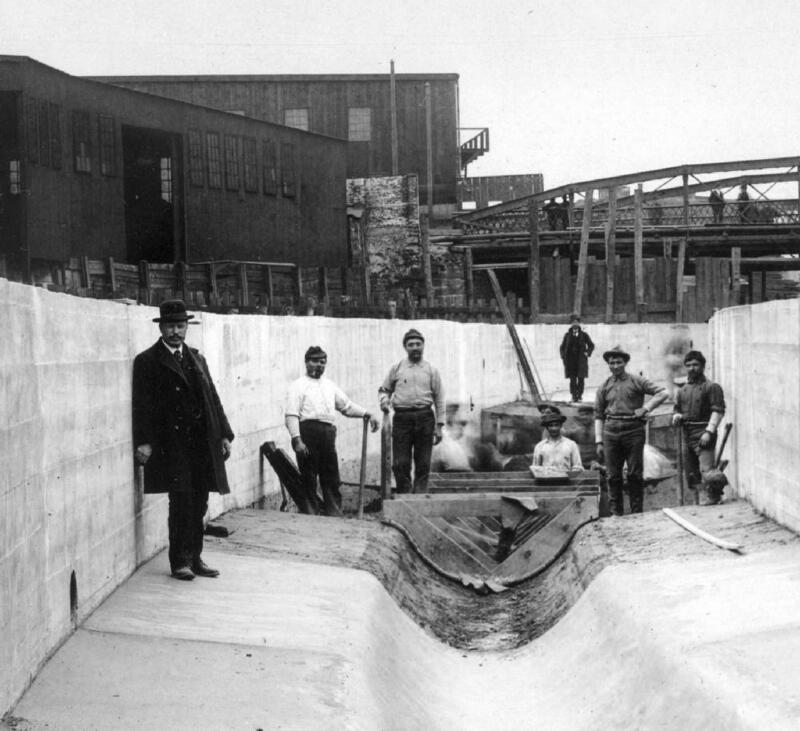 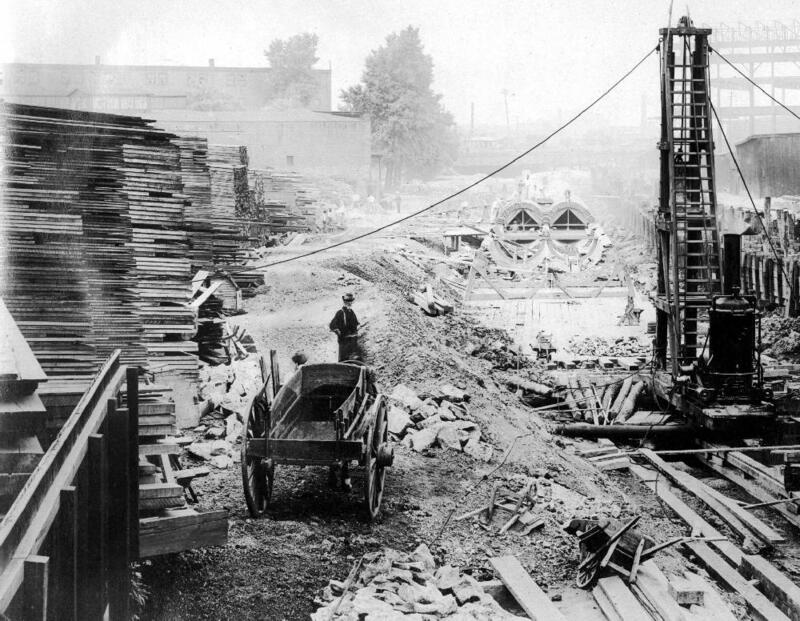 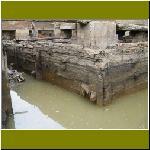 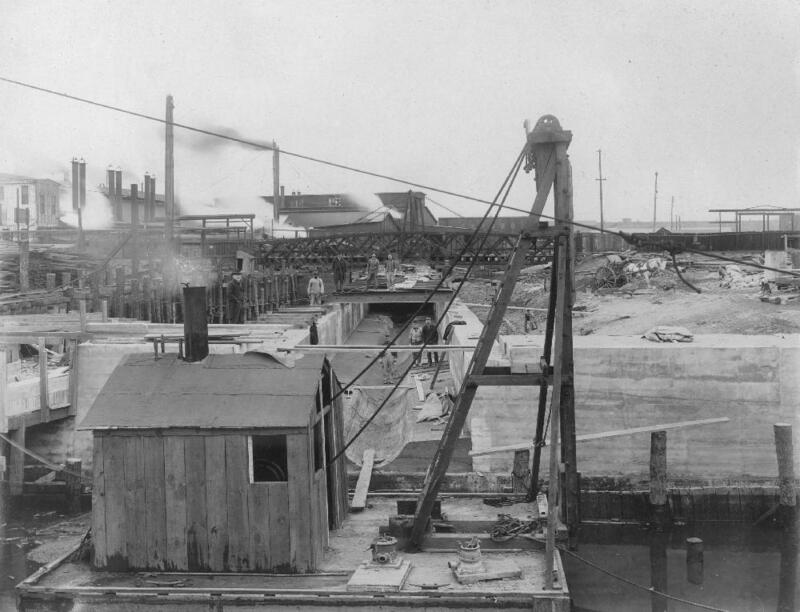 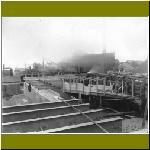 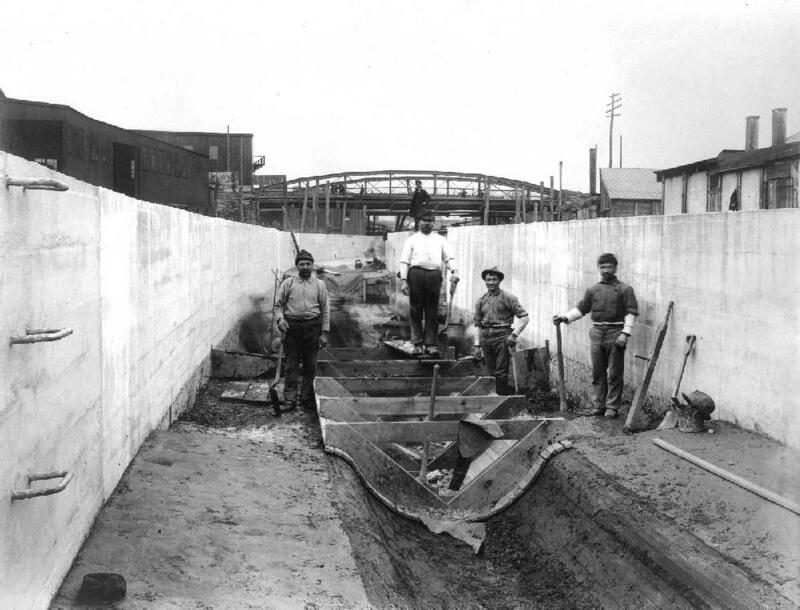 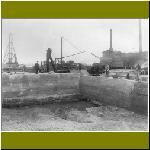 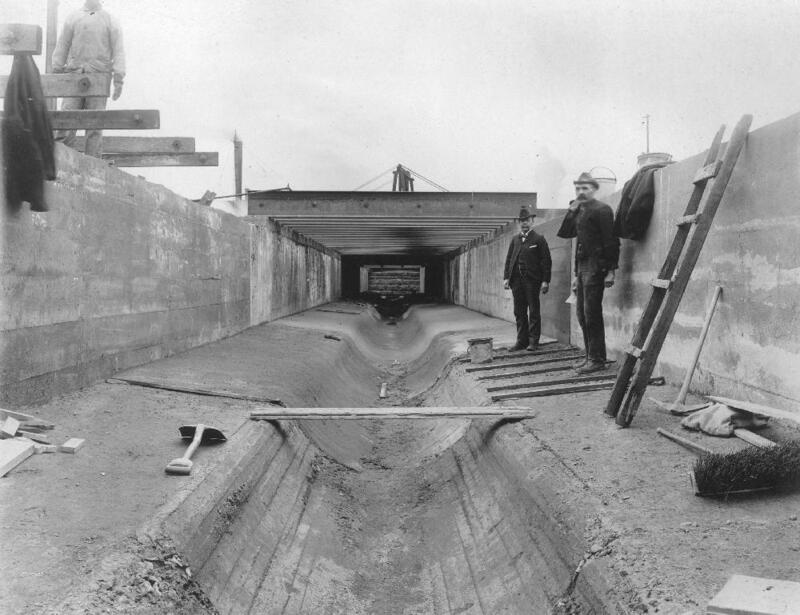 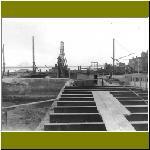 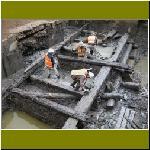 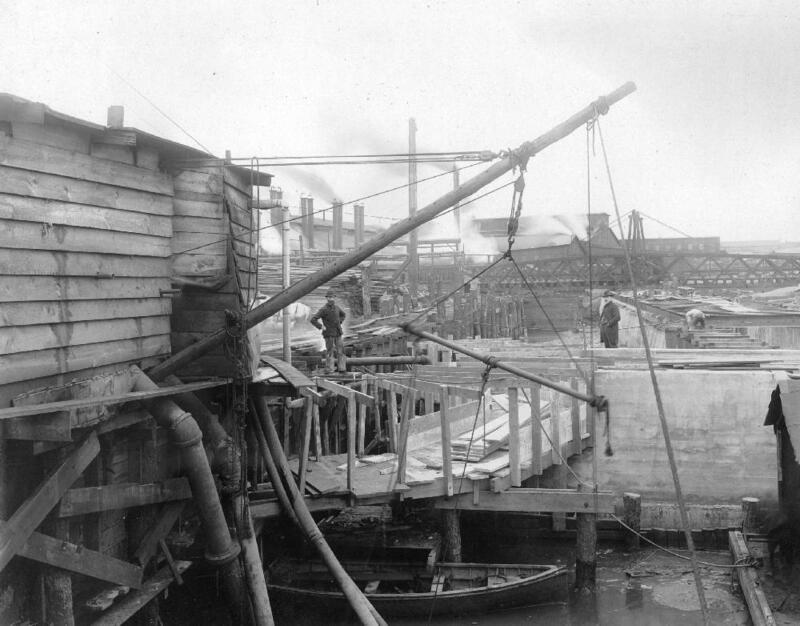 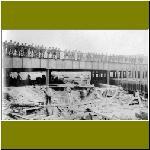 As shown in the color photos (taken by Geiger), URS uncovered the wooden cribbing that formed the walls of the canal, and the brick and concrete foundation of a locker room and toilet facility that was built by the Cramp Shipyard on top of the old canal bed, and later demolished. 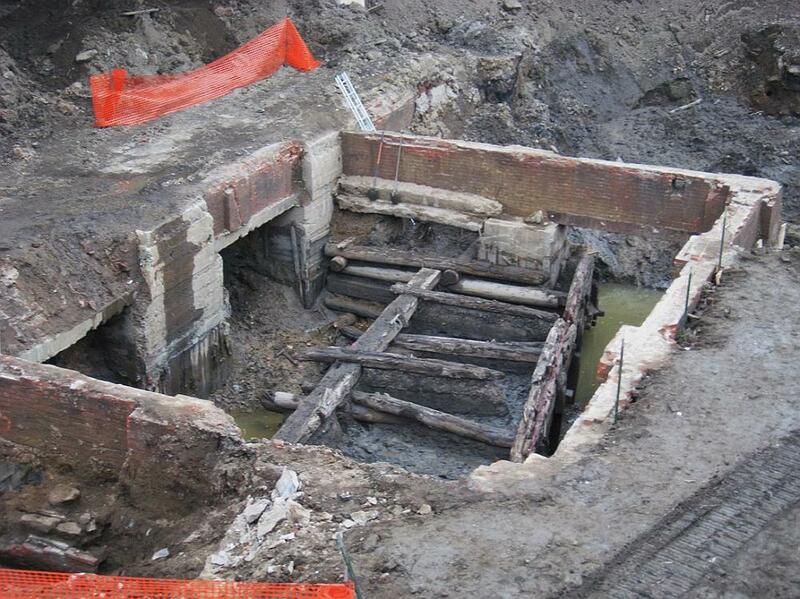 Sometime this year URS will be releasing a report on this excavation, and when it is posted online I will add a link to it here. 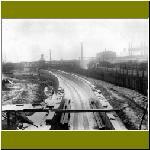 In June 2009 A. Leonard Pundt, District Quality Improvement Coordinator for PENNDOT, offered his own compilation of maps and photographs of the Aramingo Canal excavation. 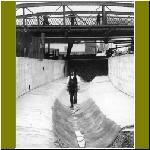 To download this PDF (23 mb), click here. 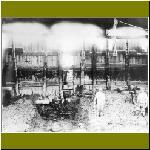 Thanks, Len! 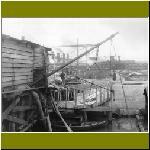 Descriptions of the black and white photos are below. 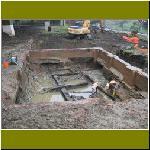 Images suffixed with a small case letter are details of the main image. 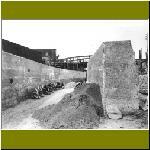 with the brickwork of a later building on top of it. 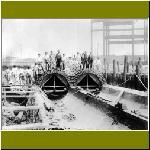 01: Aramingo Sewer. 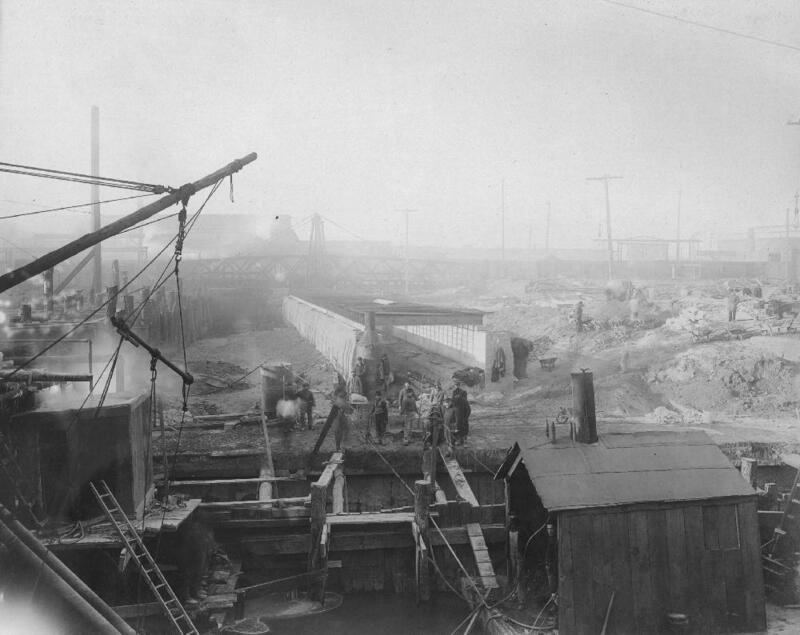 March 20, 1900. 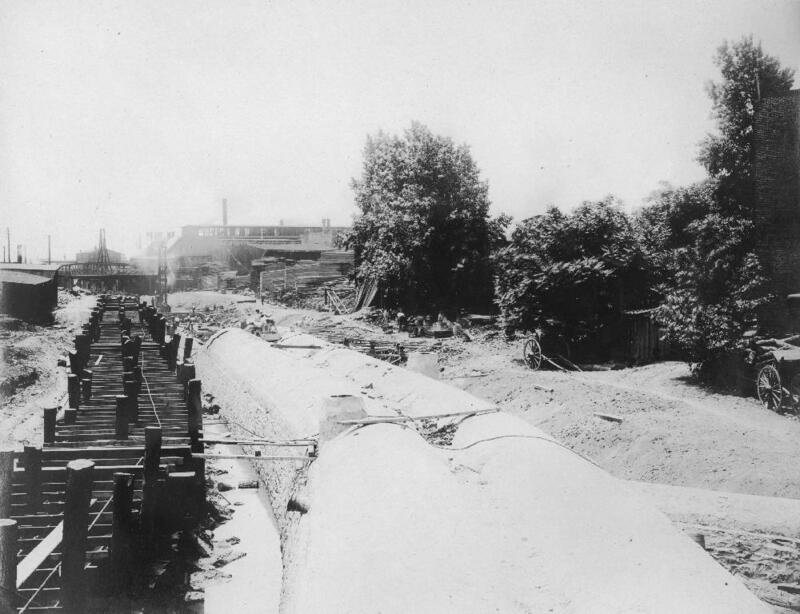 View showing sewer north of Girard Ave. and Norris St. bridge. 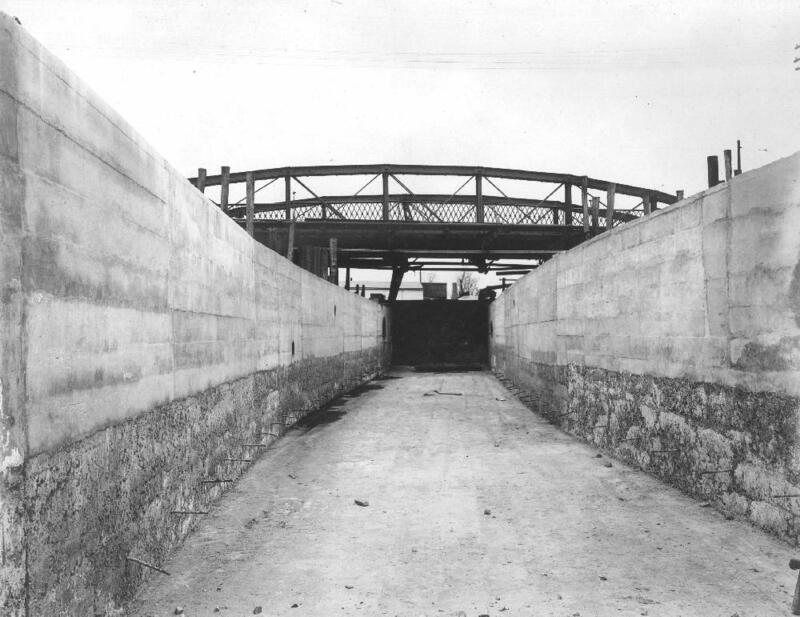 02: Aramingo Sewer. 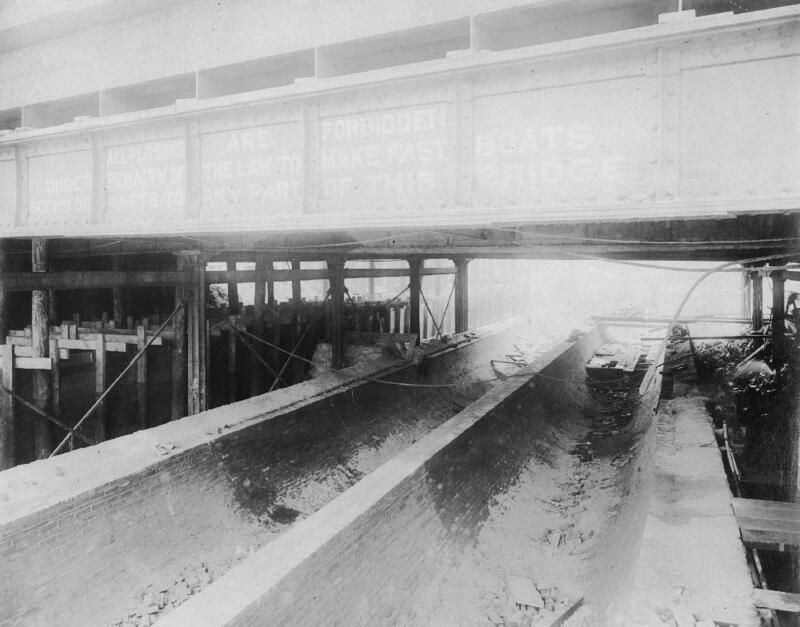 May 2, 1900. 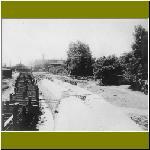 View from Girard Ave.
08: Aramingo Sewer. 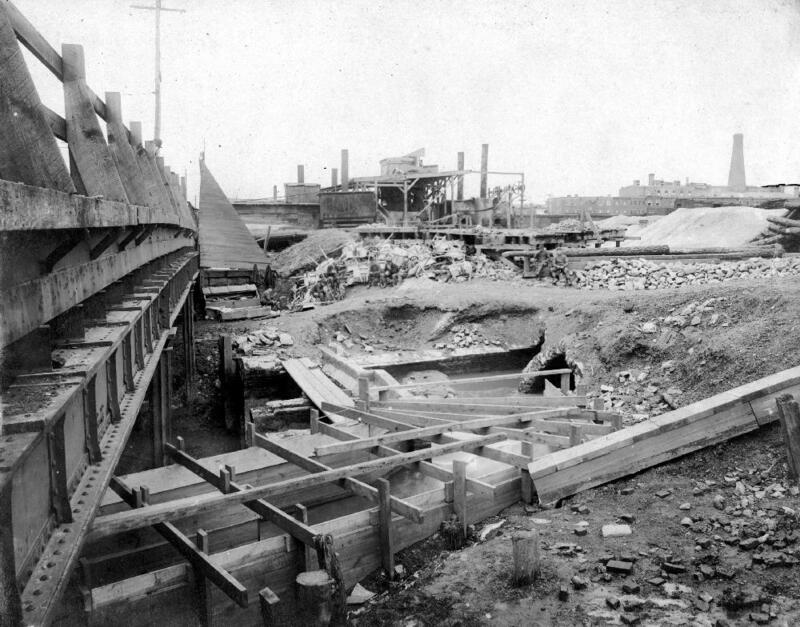 June 26, 1900. 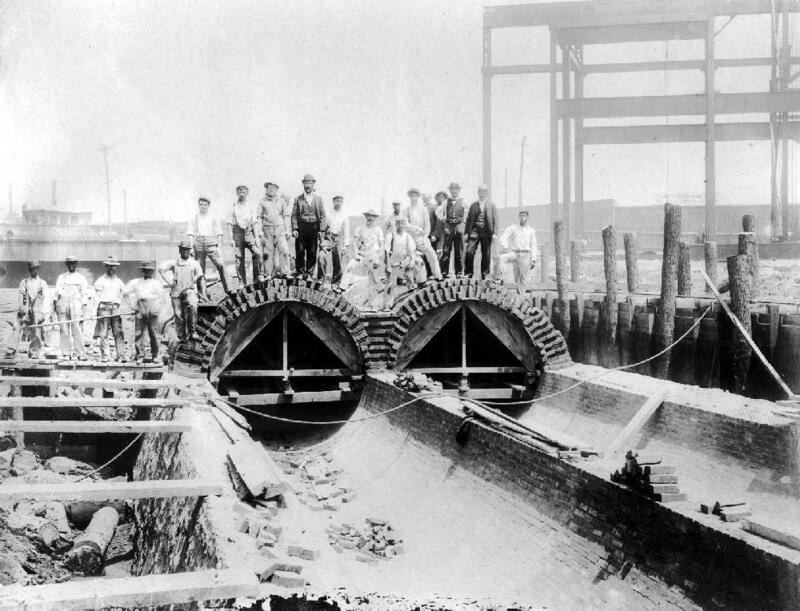 09: Aramingo Sewer. 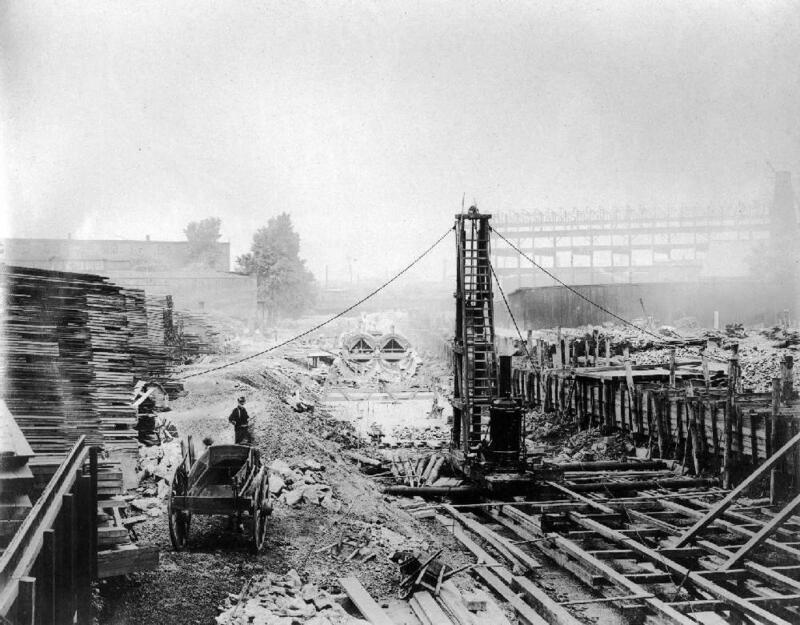 June 26, 1900.